Wing Commander: Prophecy is now available at GOG for $5.99. There is a simple joy to flying around in a spaceship and blowing stuff up that really can't be matched. 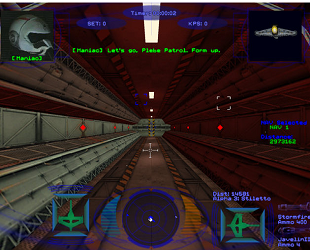 The Wing Commander series, in turn, is often counted among the best of the best when it comes to games that built themselves on the fun of space-based "p-koo p-koo." For some time now, GOG has been able to boast the majority of the franchise among its various retro products and, starting today, the digital retailer will be adding another entry from the series to its catalog: Wing Commander: Prophecy. The fifth and last game in main series, Prophecy takes place a few years after the Kilrathi War that serves as the backdrop for the bulk of the series. Dropping players into the shoes of Lance Casey, a rookie pilot aboard the advanced ship the TCS Midway, it follows the conflict between the Terran Confederation and a new alien enemy whose coming was foretold to be the beginning of the end of the universe. Personally, I couldn't be more excited for Prophecy's release. While I have played the Game Boy Advance version in the past, it's the one game in the PC series that I haven't really had a chance to try. That being the case, I'll be writing up my impressions ofWing Commander: Prophecy for a new edition of Good Old Reviews that will be coming out this Saturday. In the mean time, if you want to give Prophecy a try, you can find it at GOG for $5.99.